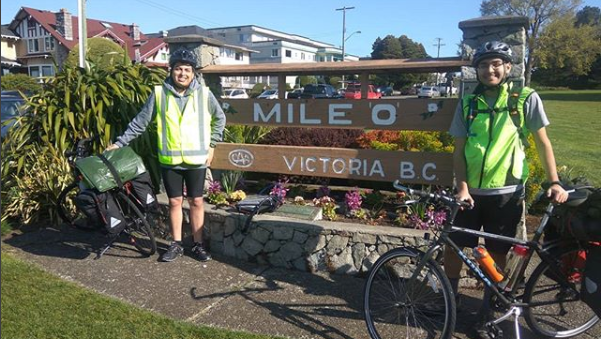 Skyler Roberts poses for a photo at "mile zero" before embarking on his cross-Canada bike ride for Alzheimer's. HALIFAX - A young man cycling across all 10 Canadian provinces to raise money for Alzheimer's disease research is closing in on the finish line of his 8,000-kilometre journey. Skyler Roberts, 21, left Victoria three months ago with his best friend and recently touched down in Halifax. Roberts has raised nearly $2,000 for the Alzheimer Society of Canada in memory of his grandfather, who had the disease for several years before his death in Janurary. He says it was painful to watch the way the Alzheimer's disease changed his grandfather. From Halifax, Roberts and a friend have plans to bike up to Cape Breton and hop on a ferry to Port aux Basques, N.L., where they'll make their way to their final destination of St. John's, N.L. Before embarking on the trip, neither of them had any cycling experience, but Roberts says they're "definitely cyclists now."